Devilbiss Finishline 3 Stage Regulator Coalescer & Carbon Filter Air Fed Mask. Delivered Monday to Friday Only. Deliveries Monday to Friday Only. All orders received Monday to Friday before 12:00pm will be dispatched the same day EXC UK BANK HOLIDAYS. Gauge Range 0-11 bar (0-160psi), Width: 230mm, Height: 238mm, Weight: 3250g. 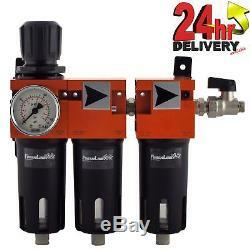 Maximum Air Flow: 25 cfm, Air Supply Pressure: 18 bar, Regulated Air Pressure: 8 bar. Maximum Operating Temperature: 50 °C (not suitable for low bake booths/ovens), Main Filtration: 0.01 micron. 3 Stage Filter Set: 9450102, XA12, AC12. This competitive filter regulator is the ideal partner to the DeVilbiss Vizi and Pro Air-Fed Visors. With air filtration down to 0.01 microns and activated carbon removing contaminants down to 0.003 ppm for both breathing and spraying. It is designed to remove entrained dirt, liquid, oil and water from flowing compressed air. The self-locking regulator together with the clear analogue gauge provides accurate air pressure control. It is supplied with a wall mounted bracket and ball valve controlled air outlet. Technical Specifications: Air Inlet Connection 3/8" BSP Female Air Outlet Connection 1/4" BSP Male connection with ball valve Gauge Range 0-11 bar (0-160psi) Width: 230mm Height: 238mm Weight: 3250g Maximum Air Flow: 25 cfm Air Supply Pressure: 18 bar Regulated Air Pressure: 8 bar Maximum Operating Temperature: 50°C (not suitable for low bake booths/ovens) Main Filtration: 0.01 micron Final Filtration: Activated Carbon 0.003 ppm (odour removal) Drain: Semi-Automatic. 3 Stage Filter Consists of: 9450102: First stage, replacement filter element XA12: Second stage, replacement coalescing filter element AC12: Final stage, activated carbon replacement filter element. This product may contain hazardous materials and therefore appropriate personal protective equipment should always be used. A Health & Safety data sheet is available on request, please messgae us and will forward a copy to you. This is supplied for industrial use only and in purchasing this product you acknowledge that you understand the implications regarding its use. Monday Tuesday Wednesday Thursday Friday. Google: Bitec Paint and Refinish Supplies. The item "Devilbiss Finishline 3 Stage Regulator Coalescer & Carbon Filter Air Fed Mask" is in sale since Friday, January 10, 2014. This item is in the category "Vehicle Parts & Accessories\Garage Equipment & Tools\Paints & Supplies\Other Body Paint & Supplies".